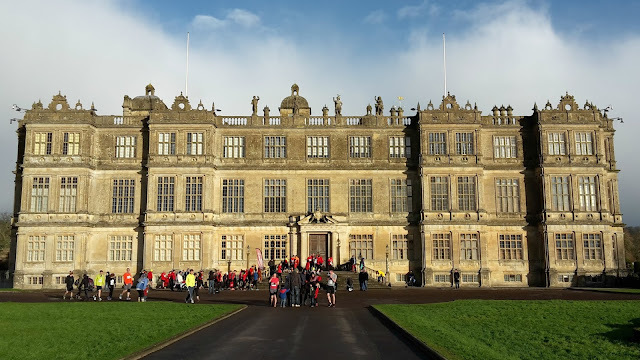 The Longleat 10k had been looming on my half marathon training plan for a while and I was looking forward to it - although with some trepidation once word of the hills had spread online and was confirmed by a running friend in the real world. Due to this I started to look upon it as a training run, rather than any attempt to set any 10k PB, so I went along yesterday in quite a relaxed manner just looking forward to running in a crowd with the only target being conquering those hills. I gave myself a good half an hour to get there, having checked the route online, and was hoping to meet my running friend at 8:15. However, the traffic entering the event was heaving and I was stuck for a mile in a slow moving line that resulted in me parking up at 8:55 with the race due to start at 9:00. I made a mad dash to the toilets, pulled on my running vest, called my friend to say I'd see her if I see her, wrestled my phone into its armband, yanked my buff over my ears - it was chilly out - and shot over to the start line where, thankfully, they held off the start for about ten minutes. I had planned on putting myself midway in the sub 10 minute mile and sub 9 minute mile start area but nobody really knew where these were so I moved down away from the front as I didn't want to hold up the fast runners. Then we were off. The route started with a nice flat road past the famous Longleat House. Then we approached the first hill. 'This doesn't seem so bad! ', I thought to myself as I reached the top and it flattened out a bit. I dug deep, trying to ignore the 11:40 minute mile pace on my TomTom, and I slowly ran up the toughest bit happy to arrive on the Horningsham village road at the top. This looped past the rather nice looking Bath Arms pub before taking us, on the very welcome downhill stretch of Lodge Drive, back towards the house. The second loop went through the grounds a little and headed towards another hill with the water station at the base where I hastily grabbed a bottle to swill my mouth out and take a couple of sips - I can never take on much water whilst running without feeling sick. The second hill dragged a bit then it was back down the other side ready for the third and final loop - a repeat of the first one and that hill again. Determined not to let it beat me I headed on up knowing that the end was in sight. I looked at my watch and some quick maths told me that a sub hour finish was in my reach. With this in mind my legs mustered up some energy to drive me along that last stretch back towards the house and this was one the best feelings I have had running; knowing that the finish line was almost there, having a fantastic view in the distance and knowing that I was fit enough to beat those hills. The clock was ticking into the 57 minute zone and I was beaming. A quick stop of the TomTom told me my finish was 56:32, with my official chip timing coming in at 56:34 and a finish time of 57:09, placing me 536/1500 runners and 134/775 female runners. I was so happy with that and then, once I had received my medal and got my goody bag, I saw my friend, who was not long behind me all that time, and a big hug was much needed before heading home for a long hot bath. Getting out of the estate was much easier than getting in and the road out took me back up that hill with the realisation of just how long it was but I smiled to myself in the knowledge that I ran that hill - twice! A look at my splits later made me chuckle; very up and down to match those hills! 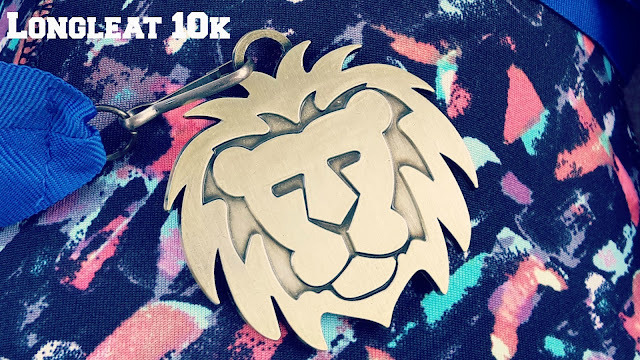 And, one more thing ticked off my 40 things to do before 40 list; Number 1 - Run in a 10k Race!